Dollar Permanent Marker now with a clip which makes it easy to carry in pocket. The truly universal permanent marker for all surfaces has gone green. Made up of a minimum of 37% recycled materials, the Permanent Marker is truly Eco-Friendly: Refillable, Recyclable and Xylene / Toluene free. Permanent Marker, is permanent on Plastic, Glass, Metal, Fibre, Film, Paper & Board, Textile, OHP, CD/DVD and more . 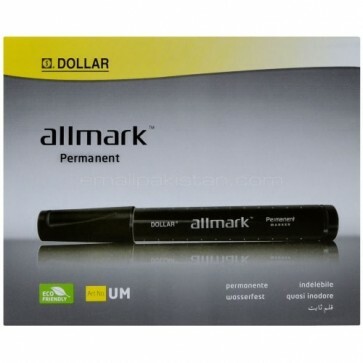 . .
Dollar Permanent Marker now with a clip which makes it easy to carry in pocket. The truly universal permanent marker for all surfaces has gone green. Made up of a minimum of 37% recycled materials, the Permanent Marker is truly Eco-Friendly: Refillable, Recyclable and Xylene / Toluene free. Permanent Marker, is permanent on Plastic, Glass, Metal, Fibre, Film, Paper & Board, Textile, OHP, CD/DVD and more . . .